A few weeks ago, I was flipping through the vinyl stacks at the Bellevue location of Silver Platters. 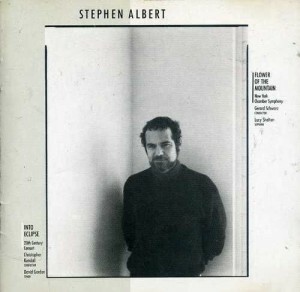 This album by Stephen Albert caught my eye immediately. I knew right away it was Nonesuch release. The typeface, the stark black and white photography, the clean design — the only other label with such a clear cover aesthetic is ECM. In fact, label president Robert Hurwitz worked at ECM before taking over Nonesuch. I checked the back cover, and sure enough, there was a Nonesuch logo. Flower of the Mountain was released in 1987, the same year as Kronos Quartet’s White Man Sleeps and John Adams’ The Chairman Dances. But who was Stephen Albert? I hadn’t heard of him, and I know nothing of this album. So I bought it without sampling it beforehand. Just one of those rash purchases. Another remarkable aspect of this album is the title piece. “Flower of the Mountain” refers to Molly Bloom’s soliloquy at the end of Ulysses by James Joyce. The Joyce estate can get pretty draconian protecting the author’s copyrights. Albert, it seems, managed to secure permission to use this text, while the Joyce estate told Kate Bush no. So Bush ended up writing “The Sensual World”. Bush would later secure permission when she re-recorded the song and re-titled it … “Flower of the Mountain”. Albert’s Flower of the Mountain is a fairly genteel piece, decidedly tonal but not exceptional. It’s the accompanying piece, Into Eclipse, that steals the spotlight. Into Eclipse has more sharp edges with a much more striking orchestration. It’s also the piece that is more readily available of the two. Into Eclipse can be found on Julliard Orchestra recording (New World 80381) and on an Eastman Music Nova album (Albany 192). By contrast, Flower of the Mountain is available only on this out-of-print Nonesuch release. So why hadn’t I encountered Albert till now? It turns out Albert died in a car crash in 1992. His career was on the rise up till then. Two years before Nonesuch released Flower of the Mountain, Albert earned the Pulitzer Prize for his Riverrun Symphony. Travis Higdon ran Peek-a-Boo Records out of an office we both worked at during the late ’90s. At first, I found that misappropriation of office resources distasteful. Then, the office politics pissed me off, and I thought Travis could have done more to misappropriate office resources. But meeting him introduced me to his band, The Kiss-Offs, who attracted quite a bit of buzz in the Austin music press. The band’s debut album, Goodbye Private Life, became one of my favorites in 1999. They split up after releasing a second album, Rock Bottom, in 2001. Peek-a-Boo had a pretty nice roster around that time. The Prima Donnas were reviving the ’80s at a time when everyone shat on the ’80s. Silver Scooter was a proto-Death Cab for Cutie with a bassist who really, really dug New Order’s Peter Hook. But I missed out on the band Travis formed before the Kiss-Offs: The 1-4-5s. 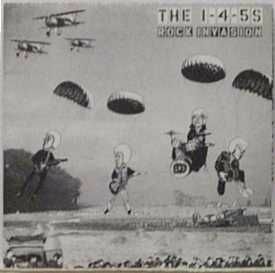 A few months ago, a used LP of the 1-4-5s’ Rock Invasion showed up at Jive Time Records. I hadn’t thought about Travis or Peek-a-Boo in years till I saw that LP. I didn’t buy it right away because, as usual, I was cash-strapped. But it did afford me some time to find an EP Peek-a-Boo released called “Unsafe at 45 RPM“. I’ve made my distaste of garage rock known, but I don’t mind garage rock from people I admire. So I eventually picked up Rock Invasion. It’s fast. It’s bratty. It’s lo-fi. It has “rock” in the every song title on the album. I particularly liked how there was a hidden track … on vinyl. Given the space constraints of an LP, the songs on Rock Invasion are pretty compact if a portion of groove real estate can be devoted to a gap of silence. I can hear hints of the Kiss-Offs in the 1-4-5s, but the songcraft that would mark Travis’ later bands is not on display here. The 1-4-5s, like their name suggests, kept things rustic. At the tempos they played, there was no time for complexity. I forgot to include a few titles from the last round-up. Yeah, I’m old enough to have actually downloaded this album from the iTunes, and yes, I know exactly who U2 is. Giving away an album for free can really backfire if the album in question doesn’t spur a fan to buy a physical copy. I may drop the cash because Songs of Innocence is better than No Line on the Horizon. 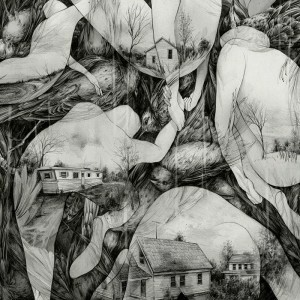 Unfortunately, it’s as forgettable as anything the band has produced since the end of the last century. I’m rather glad MONO has finally realized that their orchestral sound can only go so far, and I look forward to hearing the reportedly rawer sound. But two albums? What can I say? I’m a sucker for the grandeur. As a latecomer to Fugazi, the news of a release of music I’ve so far not yet encountered is pretty much equivalent to saying it’s a new album. Part of me was really tempted to catch the premiere of this work by the Seattle Symphony, but I’m not as familiar with John Luther as I am with John Coolidge. NPR First Listen previewed the album, and skeptic though I may be of accolades — including a Pulitzer — this one was well deserved. I think my fascination with New Amsterdam Records has cooled off a bit, but the label still grabs my attention from time to time. This collection includes pieces by Nico Muhly, Timo Andres and Sufjan Stevens. What? No Bryce Dessner or Richard Reed Parry?